GEO's 2016 Senior Leaders Roundtable is an exclusive invitation-only program designed to meet the unique high-level training needs of today’s senior-level human resources, executive compensation and equity compensation professionals. This unique program provides the setting to have dynamic dialogue regarding global issues with peers from around the world and provides attendees an up-to-the-moment look at topics relevant to the senior leader from leading academics and industry professionals. Registration is limited to senior-level issuer attendees by invitation only. Targeted training and invaluable peer networking to qualified senior-level professionals. Discussion on the challenges of designing and implementing global pay strategies in an increasingly complex, uncertain environment. Reduced price for attendees of GEO’s 17th Annual Conference. An afternoon of facilitated learning on best practices and dedicated time for Q&A with the presenters. 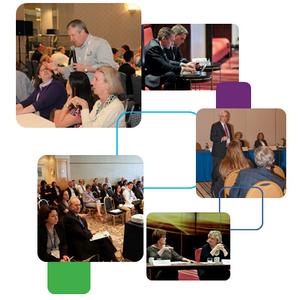 Advanced-level interactive sessions designed primarily by leading academia just for participants. Interested participants must be Director and above. Separate registration is required for attendees of GEO's 17th Annual Conference in Boston. Invited issuers who are also attending the 17th Annual Conference may register for this event for $179 per attendee for the six-hour program. Registration is open to attendees who are not registered for GEO's 17th Annual Conference in Boston. Invited issuers who are members of GEO may register for this event for $425 and invited issuer non-members may register for this event for $720. How can corporate leaders set the tone at the top in an increasingly complex and fast-moving world? What are the key roles leaders need to play if they are to unleash talent and enable their organizations to truly create value? Through a vigorous discussion of a brief case-study, we will examine some enduring challenges of leadership and some contemporary ways of meeting those challenges. Does equity-based compensation have a positive influence on employee motivation? Does equity-based compensation have a positive influence on individual employee performance? Does equity-based compensation have a positive influence on organizational performance? This session will provide answers to these questions and present other important findings from this remarkable study. Effective compensation committee and board communications regarding your global equity program is critical. The power is in the preparation. To ensure comp committee meetings are successful and effective, and that you’re adding the maximum value to the process, mix and match the best of your compensation consultants, equity plan providers, and internal resources. With new tools, techniques and years of practical experience, this session will help you refine your compensation committee communications. This presentation is about how recent innovations in academic research – on topics such as executive compensation, audit fees, and corporate culture – have yielded several data sources and methods for generating leading indicators of organizational outcomes. In particular, the presenter will discuss leading indicator implications of data sources such as social media preferences; the mandatory expanded disclosure of executive compensation details; the voice recording, written language and speaking style of executives; and the variation in the level of an organization’s audit fees not explained by observable economic factors. This session will provide an overview of the challenges associated with performance monitoring and reporting, highlighting situations that are more or less amenable to analysis. It will cover performance effect testing basics, including data requirements, the importance of considering selection effects, and control of other factors that influence equity compensation and performance. Case studies will be used to demonstrate the creative approaches of successful companies.